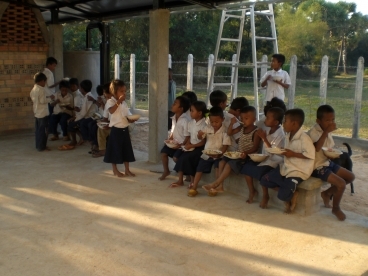 Children at the Ampil Peam school eating in the newly built kitchen and dining pavilion. 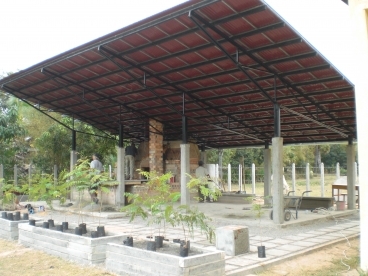 Students in Civil Engineering and Architecture design new classroom structures for the Jay Pritzker Academy in Siem Reap. livelihood with additional jobs that take them away from the classroom. turned to the School of Architecture + Planning at MIT for advice. offering support to schools in the surrounding area. discovered what really mattered to their Cambodian pen pals. “It was important for calibrating our designs to kid life and changing our perspective,” says Julianna Sassaman (G Course 4). approach to the issues and offering their own expertise in turn. often eke out a livelihood with additionaljobs that take them away from the classroom. to schools in the surrounding area. Meejin Yoon to design classroom structures to accommodate 400 students. changing our perspective,” says Julianna Sassaman (G Course 4). to the issues and offering their own expertise in turn. build helped me understand how it all makes sense together,” she says. better future for themselves, their families, and their country. Construction on the classrooms is slated to begin in September 2010.